I’m constantly talking to potential customers and while I’m not always trying to sell them something, I hear a lot of people talk about how loyal they are to local businesses. I’m not saying there’s anything wrong with that, not at all, but it strikes me as somewhat hypocritical when I hear people on a high horse or soapbox waxing poetic (in their minds, at least) on how virtuous they are or their company is because they buy locally. I know it’s not necessarily a cut and dry issue- they may spend dollars locally on very specific things and shop elsewhere for everything else. The prospective customers I’m talking to may indeed buy what my company sells from the guy down the street and maybe everything else they have shipped from China for all I know. That’s just bad luck or timing on my part, I suppose. I typically feel slightly put-off though, when I’m told someone only buys locally, and I often respond, sometimes failing to keep the irritation from my voice, “Oh, and do you only sell your products locally then?” I realize how silly it sounds, but sometimes if throws the person on the other end off just enough that I can get a bit more detail out of them about what exactly they’re buying locally and what they’re not. Sometimes it’s just their way of getting rid of me, and I understand that too, it comes with the job. In some cases, buying locally to THEM means that they buy from the Wal-Mart they pass on their way to the office each day. Sure, I can appreciate that local jobs exist there and perhaps that’s what they’re supporting, but I don’t think many people understand that THOSE big companies aren’t necessarily looking out for local business interests either. How many mom & pop’s are gone now because of the big box stores? Anyway, this is mostly just a rant to get it out of my head so I can continue with my day. I’m still left wondering about answers to the question I posed above. Today I started as the newest Staff Writer over at Bleedin’ Blue, an awesome St. Louis Blues Hockey fansite. 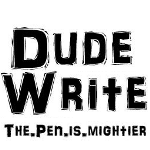 If you enjoy my writing, follow me over there and keep an eye out for articles and game previews/reviews. My first article is up, you can see it HERE! 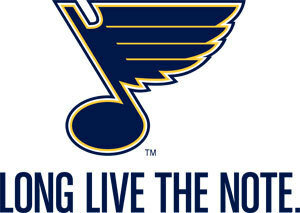 If you’re not a St. Louis Blues Hockey fan, first, shame on you. Second, that’s really not a big deal. To each his or her own, as they say. I will still be writing here, it just wont be about the Blues. No worries. Inspired by my friend Kat over at Kat O’ Nine Tales, here is a song and some answers to questions you didn’t know you wanted to know but I just know you’ll be glad you now know. Proceed with caution. 1-Did you ever wonder how they get the “M”s on M&Ms? Yeah, no. Sometimes I wonder why there aren’t more green ones in each bag, but then I’ve been M&Ms free for a while now, so I don’t even wonder that much anymore. Actually sort of rude for you to taunt me with the memory, thanks. 2-If you could only read one book for the rest of you life, what would you have for a snack? Smoked almonds, definitely smoked almonds. So hard to remember. Using my Call a Friend lifeline on this one and he says it was probably Depeche Mode, possibly The Smiths-Meat is Murder. 4-Are you stealing your Internet? If so where are you located because I’m tired of paying for mine. Not even. My 50Mbps cost me an arm and a leg, but it’s fast and I’m thrilled. 5-Do you think that I’m joking? Yeah, no. I can tell by your unsettling stare you are dead serious. 6-Should I keep asking questions? Do you honestly think we’ll keep answering them? 7-If you answered “no” to number 6, why did you read this? If you answered “yes”, are you mental? If you have to ask ~sob~ ~choke~ I guess you don”t really know me at all! That is highly improbable, and would likely result in some sort of tear in the fabric of Space and Time. 10-Number 9 wasn’t a question unless you are me, then you know what I was asking. 11-Are you sleeping okay, dear? Much better lately, actually. Sometimes the dreams wake me. And the screams. Maybe it’s the screams in my dreams? Just kidding, I don’t sleep. 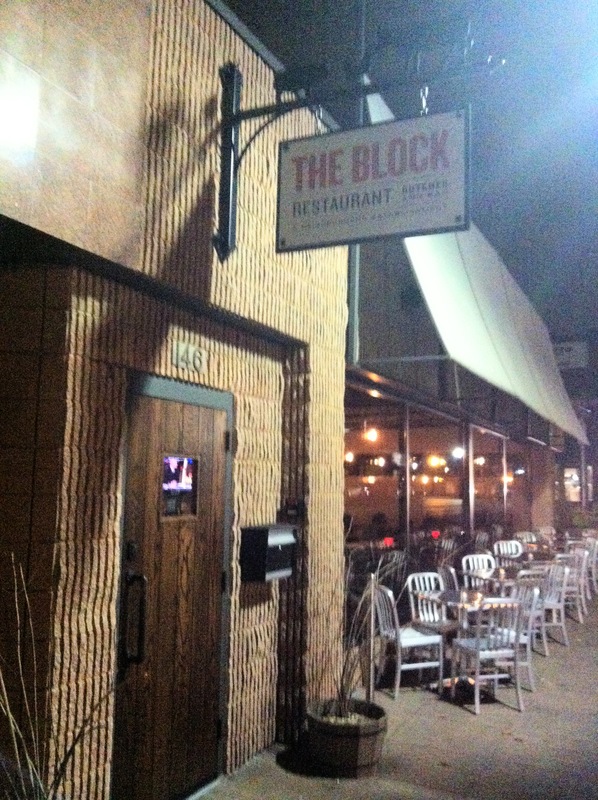 Tuesday night I had the pleasure of dining at The Block in Webster Groves. Voted one of St. Louis’s Best New Restaurants in 2011 and St. Louis’s The Riverfront Times’s Best Neighborhood Restaurant 2012, I may have a new favorite restaurant of my own. 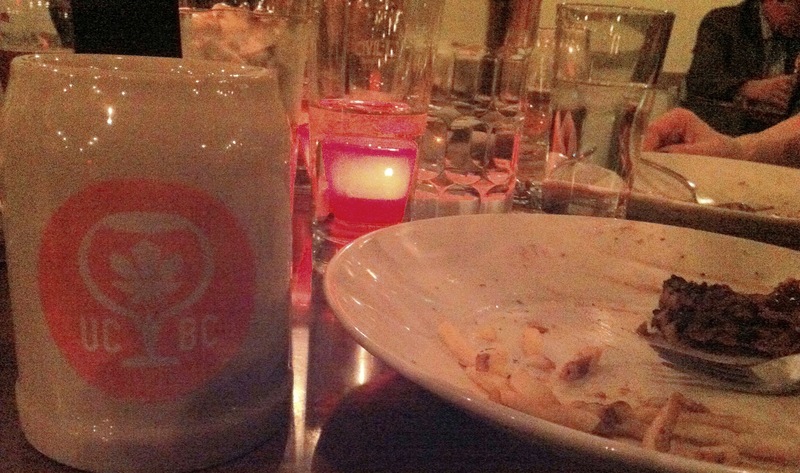 The Block combines locally grown and raised ingredients in its dishes and locally brewed beers behind the bar. Setting itself apart from most local eateries, The Block also features a full service meat counter where you can buy whole and half hogs as well as cuts of beef and pork from local farms. My dad and step-mom took my girlfriend and me there for birthday dinner and it’s one of those places where literally everything on the menu sounds incredible. From the salads and appetizers to sandwiches and full plate entrees, the Block offers what I felt was the kind of comfort food you’d want to cook for yourself at home, but with exotic twists most of us probably don’t have stocking the fridge or cupboard. We started off with these amazing pretzels, dark and crunchy on the outside, white and chewy on the inside, served with a delicious savory and sweet mustard sauce with some kind of caramelized onions. Wow. My dad and I both commented that we could probably just eat the pretzels and drink beers and be happy! More on the beers later. For the main course my step-mom had the Double Star Farms Amish Chicken: grilled chicken accompanied by Yukon gold potatoes, butternut squash, mushrooms, and arugula with a local honey balsamic reduction. They have a Grass Fed Beef menu special, sort of like the “catch of the day,” and that night it was a 12oz ribeye, served with garlic herb fries and The Block’s house steak sauce. Ribeye is my favorite cut so that was a no-brainer and it was cooked exactly how I asked. The meat was smooth and cut like butter though I didn’t even need a knife. I believe the cut of Grass Fed Beef changes, but I will get that ribeye every time they offer it. The off-the-menu specials were amazing too. We enjoyed a flatbread appetizer with shrimp and roasted red peppers which changes daily, like the Grass Fed Beef on the menu. My girlfriend had pan-seared cod with roasted red potatoes, roasted garlic, shaved Brussels sprouts, wild mushrooms and topped this unbelievable bacon jam (that you can buy in jars from the butcher’s counter, do it!) AND truffle oil! Decadent. My girlfriend and I thought we’d end up sharing but both of us cleaned our plates relinquishing only a bite or two at most. My dad had an 8oz sirloin, also cooked perfectly, served with a root vegetable gratin: potato, sweet potato, fennel maybe? And Swiss cheese. The coup de grâce though, was a BIG rib, cooked sous-vide, and riding shotgun along with the sirloin. The meat was falling off the bone as the plate was presented at the table. Amazing. All the meat is butchered fresh, on-site, and again, most of the vegetables were said to have been harvested locally. The Block even has a garden project with the local grade school nearby in the spirit of seed-to-table. 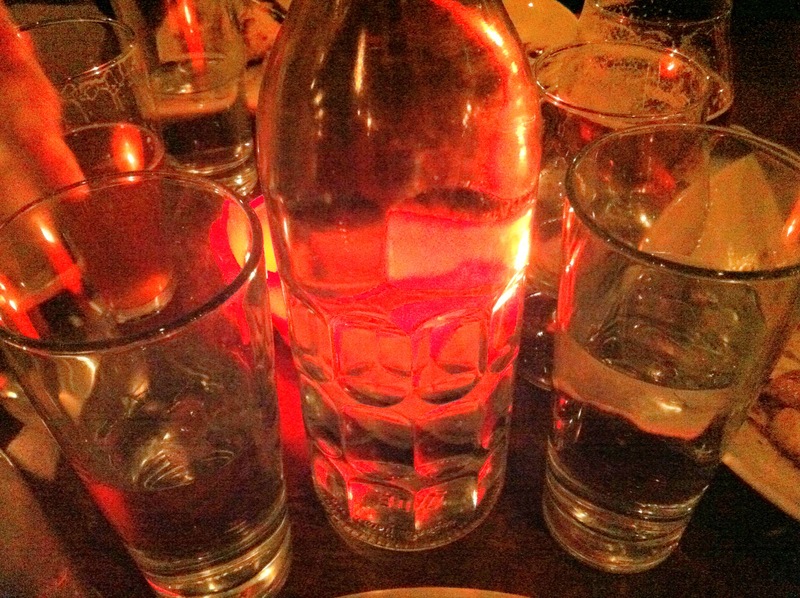 Go to The Block for the food, but by no means ignore the incredible, locally brewed beers on tap. There are a lot of micro and artisanal breweries in St. Louis these days, and most restaurants in town feature at least a couple of selections. At The Block their choices matched SO well with the food. It was masterfully done. IPA, altbier, a vanilla porter (awesome) Perennial’s Hommel Bier (RFT’s Best beer 2012) and multiple Urban Chestnut offerings, including Zwickel, Urban’s “flagship lager.” Cloudy, yeasty, unfiltered, unpasteurized, authentically German, and I swear to you, probably the best beer I’ve ever tasted while eating a perfectly cooked steak. I’m a dark beer guy and they also had Civil Life milk stout, one of my favorites, but the grass-fed beef and that Zwickel were so good together it was almost criminal. My folks drove a good hour to meet us last night. They got there ahead of us and had time to meet and talk to some of the staff who were genuinely grateful they’d come all that way to try the place. 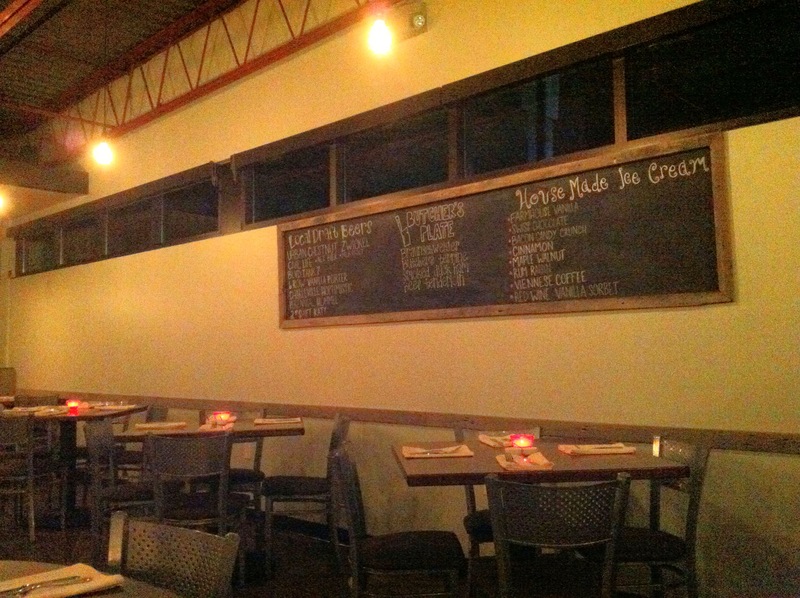 The Block is co-owned by Marc and Amy Del Pietro and Brian and Lea Doherty. Our server was friendly, knowledgeable, and made excellent suggestions. She even brought us a bit of dessert, complete with a candle, when she found out about our birthdays. A very sweet gesture, pun intended. No, they don’t sing Happy Birthday. The owners are present and engaging. Everyone there did a nice job of making the patrons feel like guests in their home, in my opinion. Oh, and while they’re making mouth-watering lunch and dinner, The Block makes their own ice-cream too! We will try that on our next visit (maybe even the Bacon Candy Crunch!) but honestly, the Six Row vanilla porter would’ve sufficed as my dessert all by itself. Come to St. Louis, seek out Webster Groves, and find The Block. You’ll be glad you did, and like us, you’ll be making plans to come back even as you’re walking out the door. The picture is in honor of today being WildCard Weekend in the NFL, and to the fact I spent most of the past two days watching all four games. I can’t say they all turned out the way I’d guessed, or hoped they would, but I don’t have any real emotional investment in any of the playoff teams this year, so that’s not a big deal. The Ravens won, for which I’m glad, but otherwise none of the outcomes were too terrible to accept. I say this knowing that I can’t stand the Seattle Seahawks, but ah well, I can always hope they lose the next one. It’s largely been a very relaxing weekend, culminating in today, January 6, which happens to be the Christian holiday of Epiphany. I wont go into the whole explanation of it, but today is also my birthday and I’ve always thought it was interesting to have been born on this day. I suppose 40 is one of those “milestone” type of birthdays and while I’m not feeling any sadness or depression or anything dramatic and clichéd over it, but I am feeling reflective about my life and where I am now that I’ve turned 40. I remember an art project from back in Middle School, maybe in seventh grade, where we had to imagine ourselves in the future and create a collage of things we thought would represent our lives at age 30. I think I had a man in a suit, maybe a Ferrari, piles of money, etc, lol. I guess I had big goals for myself. I can’t say I could’ve predicted I’d be where I am today, ten years beyond that, at the age of 40, but I CAN say I’m pretty damn happy about where my life has taken me. Sure, the trip has been bumpy, but it’s currently pretty wonderful. Like my life, I think this blog has seen some low moments and has gone around interesting twists and turns, but as it turns out I’m quite happy with what it’s grown to be. A year ago I was using it to try and keep a food journal, which was mostly just berating myself for my poor dietary choices. There were moments of self-therapy and of course self-doubt. I bemoaned the fact there likely weren’t any readers and how I was bitching about my life to myself, which is kind of disturbing, although I know I’m not alone doing it. These days I’m writing more, I’m writing short stories, I’m involved in writing communities (thank you Studio30 Plus!) and I’ve made a ton of great writer and blogger friends online. My girlfriend said she was proud of the progress I’ve made and you know what? I’m proud of myself too. I’m not really going to do a “look back on 2012,” post, but I will say I plan to do new things with my blog and my life this year, and I’m excited about where the next stage of my journey will take me. I wanted to tell her that I’d been listening to Indie Rock longer than she’d been alive, but I held my tongue. Instead, I decided to look them up and see what kind of sound they had. In doing so, I found this really cool website, which may or may not be new to any of you, but I’d never seen it before. It’s called tastekid, and it helps you find similar interests in music, movies, books, TV shows and games. It’s very easy to use and I encourage everyone to go check it out. Once again, via Should Be Reading, it’s time for WWW Wednesday! I am currently finishing up The Twelve, by Justin Cronin. It’s almost “horror” fiction, but somehow more intellectual than traditional hack & slash or monster-movie scary. This is #2 in a trilogy, the third book not yet published. It’s one of those stories that will be tough to wait for. I recently finished Cold Days, the latest Dresden Files episode, by Jim Butcher. If you don’t know Harry Dresden then you need to meet him, and fast, there’s no telling how much longer he’ll be around. Harry gets himself into hair-raising situations in every novel, and you don’t always know he’ll come out alive. Sometimes though, being dead or alive isn’t really an obstacle to a wizard. The next book I read will likely be The Renaissance Soul, by Margaret Lobenstine. This was on a list of “books that can change your life,” and looked interesting enough for me to pick up. The subtitle is Life Design for People with too many Passions to Pick Just One. This one covers a lot of ground. I plan to be more creative this year, better organized, and more committed to doing what I love to do. It will require changes to my routine, prioritizing, and a continually positive attitude, but I am eager to do what it takes to stay true to my goals. Dove-tailing in with the first one, this word means I’m going to believe that I can do whatever it is I set out to do this year. Some of my goals are personal but many of them involve my family and I plan to work together with them and my friends to make things happen. This also encompasses my religious faith in which I plan to become stronger and grow with. I say almost every year that I am going to finally quit procrastinating so often and while the sentiment is no different in 2013 I feel better prepared, more suited to actually living up to this goal. I’m not going to wait around to do things. I’m going to be more pro-active with my life and see if I can help those around me do the same along the way. What three words would you use to describe your new beginning this year? This post touches on a very personal topic and was prompted by this week’s Word over at Trifecta. As this New Year begins I’m reminded of the fragility and randomness of life. I was informed yesterday that my mother’s youngest sister has been diagnosed with Inflammatory Breast Cancer, one of the more rare and aggressive types. Definitely not happy news to start 2013, but knowing my family’s faith and spirit, I have no doubts in my aunt’s chances to overcome this terrible affliction. When diagnosed, this type of cancer is in either Stage III or Stage IV, and most of what you can find online about it is bad. I’m told there are already plans for treatment, so that might mean it’s Stage III. More information on IBC can be obtained from the Inflammatory Breast Cancer Research Foundation. I will be praying every day that she survive the chemotherapy, surgery, and radiation treatments to live her full life as daughter, sister, aunt, wife, mother, and grandmother, rather than be cut short by cancer. It’s true that cancer can effect anyone at any time, though it rarely makes it any easier to accept. My niece has been through a double lung transplant and survived. My grandmother has had a new knee, eye trouble, heart issues, and has survived. My family is full of love and faith and strength and we’ll all be praying and thinking about my aunt every moment of every day this New Year, and I’m confident we’ll be able to add my aunt to this list of survivors. I’ve been quiet over the last week or so, choosing to spend extra time with my loved ones though there have been plenty of times I thought about my blogging, new story ideas, issues and opinions. They’ll all come about in their time. This isn’t a happy return to my blog, but it will be a launching pad for support, love, and creativity this year. 2013 need not be destined for sadness, but it will certainly be a challenge for my aunt and my family to stand in the face of her cancer.